Hunter Size Chart Note: Select your US size. Please be advised, the product and box will display UK, US and Euro sizing. For US sizing, both men’s and women’s sizing is displayed. Men’s sizing is represented by “M” and women’s sizing is represented by “F”. 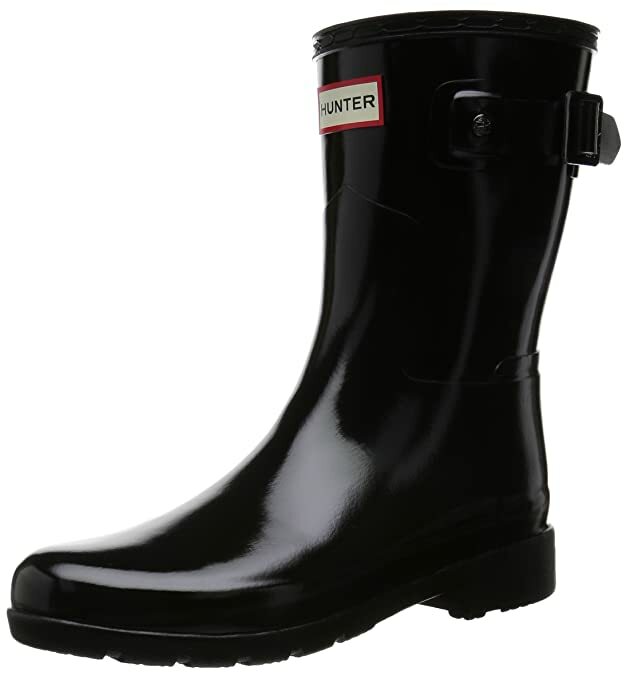 Every storm has a silver lining because you can step out in the classic Hunter™ Original Back Adjustable Gloss boots. Vulcanized natural latex construction provides a seamless waterproof shell. 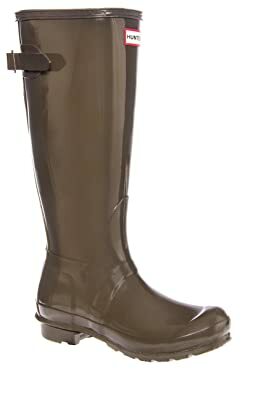 Ideal for walking through wet grass or fields as well as walking in wet conditions in the city. Pull-on design. Adjustable buckled strap at back of shaft. Signature Hunter logo on the front. Nylon lining dries quickly. Cushioned footbed with multilayered sponge insole. Rubber sole. Imported. Measurements: Heel Height: 1 in Weight: 2 lbs 5 oz Shaft: 16 in Platform Height: 1⁄4 in Product measurements were taken using size 9, width M. Please note that measurements may vary by size. Constructed from lightweight, foldable rubber, the Original Tour Gloss is an innovative remodelling of the iconic Original Tall boot. The leg of the boot folds down, wrapping around the shoe for easier packing and transportation. 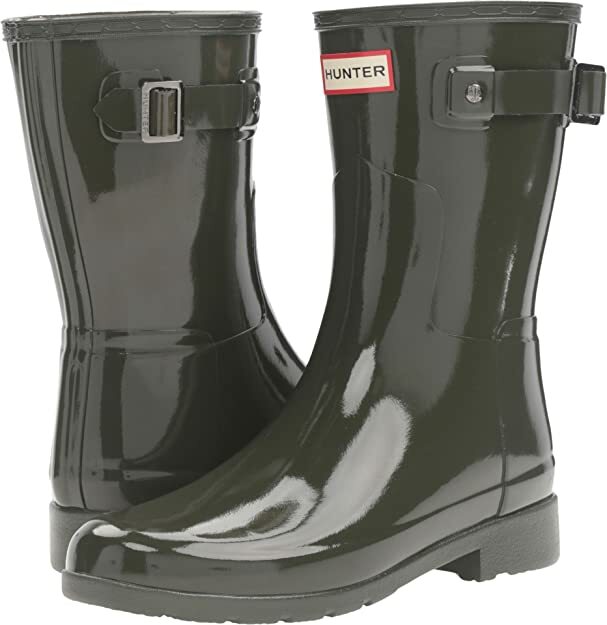 Hunter is an British heritage brand, with 160 years of history, pioneering development of new rainboots & rain accessories. Hunter Size Chart Note: Select your US size. Please be advised, the product and box will display UK, US and Euro sizing. For US sizing, both men’s and women’s sizing is displayed. Men’s sizing is represented by “M” and women’s sizing is represented by “F”. With as much versatility as the Hunter™ Original Short Gloss boots, this new design will cover all your bases. Natural waterproof rubber upper. Pull-on construction. Hunter fit and comfort. Round toe. Textile lining. Cushioned footbed. Flexible rubber sole. 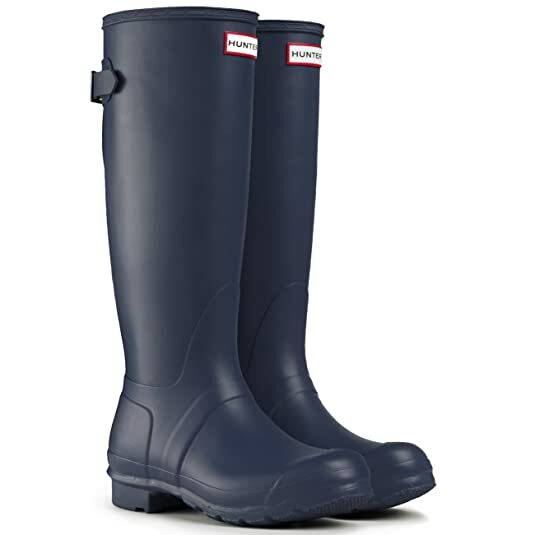 The brand advises that a white wax film may appear on the surface of the rubber boots and that it can be wiped off with a damp cloth. This “blooming” effect is not a defect. Blooming is caused when the boots are exposed to extreme temperatures or temperature swings and the wax helps prevent the rubber from weathering. Imported. Measurements: Weight: 1 lb 6 oz Circumference: 13 in Shaft: 9 1⁄2 in Product measurements were taken using size 9, width M. Please note that measurements may vary by size. Weight of footwear is based on a single item, not a pair. Hunter Size Chart Note: Select your US size. Please be advised, the product and box will display UK, US and Euro sizing. For US sizing, both men’s and women’s sizing is displayed. Men’s sizing is represented by “M” and women’s sizing is represented by “F”. 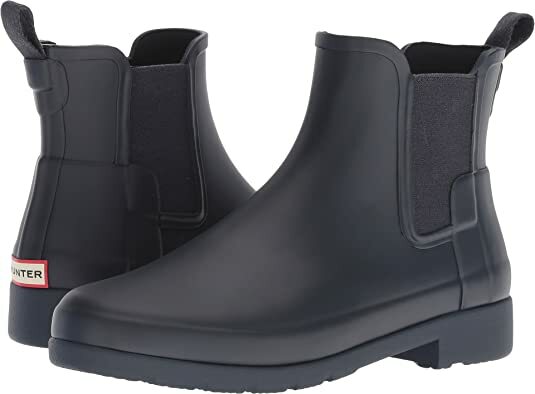 Save your toes from the rain woes with the Original Refined Chelsea boot. Vulcanized rubber upper in a slimmer construction. Pull on construction with side goring. Round toe. Quick dry woven nylon lining. Multi-layer cushioned sponge insole. Traditional calendared natural rubber sole. The brand advises that a white wax film may appear on the surface of the rubber boots and that it can be wiped off with a damp cloth. This “blooming” effect is not a defect. Blooming is caused when the boots are exposed to extreme temperatures or temperature swings and the wax helps prevent the rubber from weathering. Imported. Measurements: Heel Height: 1 in Weight: 1 lb 2 oz Circumference: 10 1⁄2 in Shaft: 5 in Product measurements were taken using size 8, width M. Please note that measurements may vary by size. Weight of footwear is based on a single item, not a pair. Hunter Size Chart Note: Select your US size. Please be advised, the product and box will display UK, US and Euro sizing. For US sizing, both men’s and women’s sizing is displayed. Men’s sizing is represented by “M” and women’s sizing is represented by “F”. Every storm has a silver lining because you can step out in the classic Hunter™ Original Back Adjustable Short boots. Vulcanized natural latex construction provides a seamless waterproof shell. Pull-on design. Adjustable buckled strap at back of shaft. Signature Hunter logo on the front. Nylon lining. Cushioned footbed. Rubber sole. Imported. Measurements: Heel Height: 1 in Weight: 2 lbs 8 oz Circumference: 15 in Shaft: 10 1⁄2 in Product measurements were taken using size 9, width M. Please note that measurements may vary by size. Weight of footwear is based on a single item, not a pair. Hunter Size Chart Note: Select your US size. Please be advised, the product and box will display UK, US and Euro sizing. For US sizing, both men’s and women’s sizing is displayed. Men’s sizing is represented by “M” and women’s sizing is represented by “F”. Please note: If your size is unavailable, please check the men’s version by typing in this SKU# 7338166. 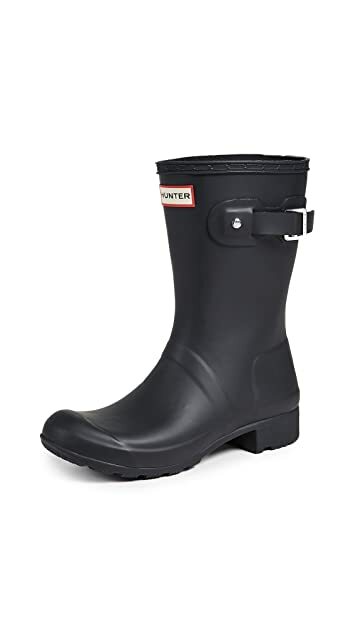 Hunter sizing has both men’s and women’s conversions. The Hunter™ Original Tour boots can be squashed, rolled, and folded into submission; which comes in handy when you have just enough room for one more thing in your suitcase! Made of pliable rubber. Pull on design. Comes with a drawstring bag for traveling. Offers foldable option for packing. For fall and winter use, warm socks are recommended. Woven nylon lining. Cushioned footbed. Flexible rubber sole. 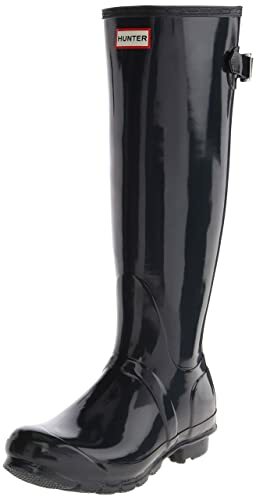 Please keep in mind that the buckle on this boot is decorative and should not be used as an aid to pull the boot on. The brand advises that a white wax film may appear on the surface of the rubber boots and that it can be wiped off with a damp cloth. This “blooming” effect is not a defect. Blooming is caused when the boots are exposed to extreme temperatures or temperature swings and the wax helps prevent the rubber from weathering. Imported. Measurements: Heel Height: 1 1⁄4 in Weight: 1 lb 8 oz Circumference: 15 in Shaft: 15 1⁄2 in Product measurements were taken using size 9, width M. Please note that measurements may vary by size. Weight of footwear is based on a single item, not a pair. Hunter Size Chart Note: Select your US size. Please be advised, the product and box will display UK, US and Euro sizing. For US sizing, both men’s and women’s sizing is displayed. Men’s sizing is represented by “M” and women’s sizing is represented by “F”. With as much versatility as the Hunter™ Original Gloss boots, this new design will cover all your bases. Natural waterproof rubber upper. Pull-on construction. Hunter fit and comfort. Round toe. Textile lining. Cushioned footbed. Flexible rubber sole. 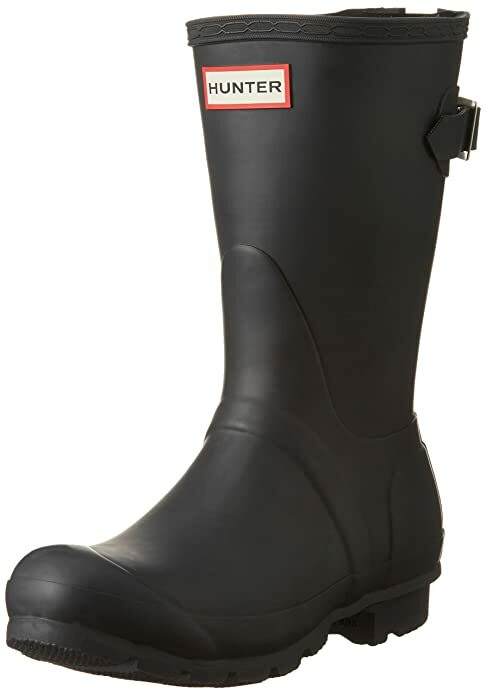 The brand advises that a white wax film may appear on the surface of the rubber boots and that it can be wiped off with a damp cloth. This “blooming” effect is not a defect. Blooming is caused when the boots are exposed to extreme temperatures or temperature swings and the wax helps prevent the rubber from weathering. Imported. Measurements: Heel Height: 1 in Weight: 2 lbs 9 oz Circumference: 15 in Shaft: 16 1⁄2 in Product measurements were taken using size 9, width M. Please note that measurements may vary by size. Weight of footwear is based on a single item, not a pair. 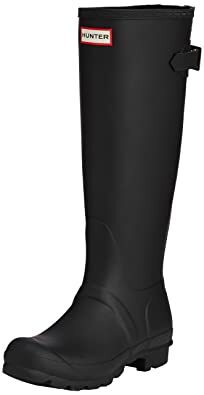 A classic finish perfects a puddle-proof rubber boot finished with a traction-gripping sole. Subtle tonal motifs circle the shaft, while an adjustable buckle at the side adds interest. 1″ heel height; 16″ boot shaft height; 14 1/2″ calf circumference. In hot or humid weather, natural latex rubber releases a protective wax film; simply wipe it off with a damp cloth. A pristine finish and shine is easily restored with regular use of Hunter Boot Buffer or Instant Boot Shine. Hunter Size Chart Note: Select your US size. Please be advised, the product and box will display UK, US and Euro sizing. For US sizing, both men’s and women’s sizing is displayed. Men’s sizing is represented by “M” and women’s sizing is represented by “F”. Please note: If your size is unavailable, please check the men’s version by typing in this SKU# 7338166. Hunter sizing has both men’s and women’s conversions. The Hunter™ Original Tour Short boots can be squashed, rolled, and folded into submission; which comes in handy when you have just enough room for one more thing in your suitcase! Made of pliable rubber. Pull on design. Comes with a drawstring bag for traveling. Offers foldable option for packing. For fall and winter use, warm socks are recommended. Synthetic lining. Cushioned footbed. Flexible synthetic sole. Please keep in mind that the buckle on this boot is decorative and should not be used as an aid to pull the boot on. 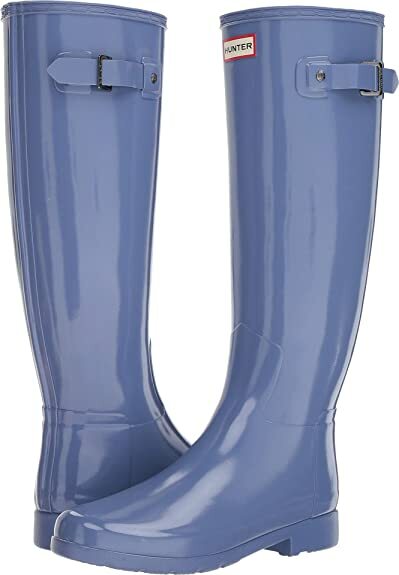 The brand advises that a white wax film may appear on the surface of the rubber boots and that it can be wiped off with a damp cloth. This “blooming” effect is not a defect. Blooming is caused when the boots are exposed to extreme temperatures or temperature swings and the wax helps prevent the rubber from weathering. Imported. Measurements: Heel Height: 1 1⁄4 in Weight: 1 lb 4 oz Circumference: 14 1⁄2 in Shaft: 10 in Product measurements were taken using size 9, width M. Please note that measurements may vary by size. Weight of footwear is based on a single item, not a pair. Hunter Size Chart Note: Select your US size. Please be advised, the product and box will display UK, US and Euro sizing. For US sizing, both men’s and women’s sizing is displayed. Men’s sizing is represented by “M” and women’s sizing is represented by “F”. Every storm has a silver lining because you can step out in the classic Hunter™ Original Adjustable boots. Vulcanized natural latex construction provides a seamless waterproof shell. 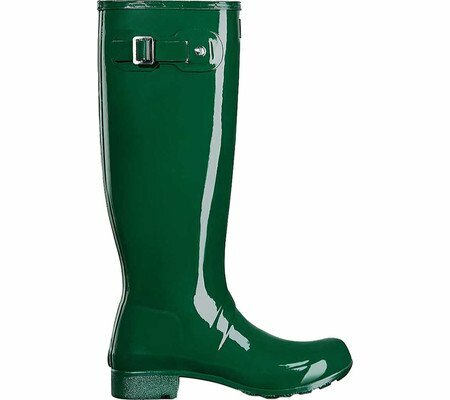 Ideal for walking through wet grass or fields as well as walking in wet conditions in the city. Pull-on design. Adjustable buckled strap at back of shaft. Signature Hunter logo on the front. Nylon lining dries quickly. Cushioned footbed with multilayered sponge insole. Rubber sole. Imported. Measurements: Heel Height: 1 in Weight: 2 lbs Circumference: 16 1⁄4 in Shaft: 16 1⁄4 in Platform Height: 1⁄2 in Product measurements were taken using size 8, width M. Please note that measurements may vary by size.